I am pleased to have two photos chosen for the 1650 Gallery exhibition “Small Towns & Rural Places,” which opens Oct. 24 in Los Angeles. 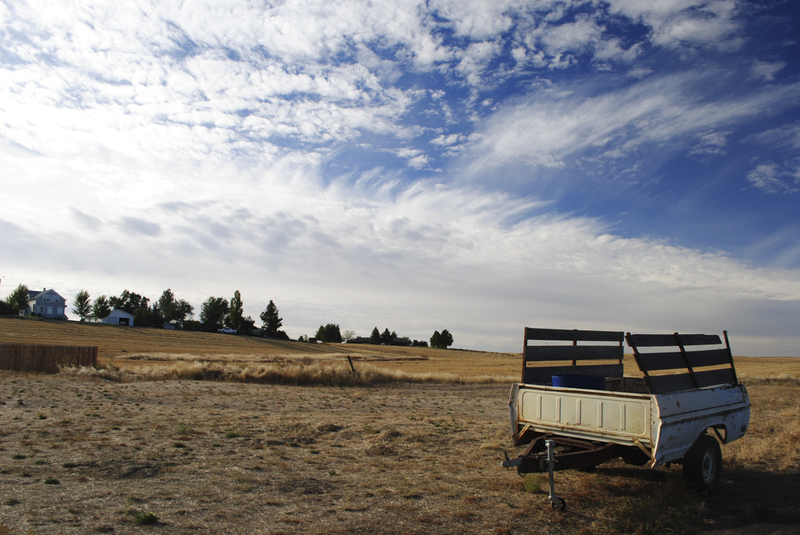 I recently explored the farmlands and small towns of eastern WA and found much photographic inspiration there. My trip seems perfectly timed for this show. Here are the photos to be exhibited. If you’re in LA later this month, please visit the gallery! 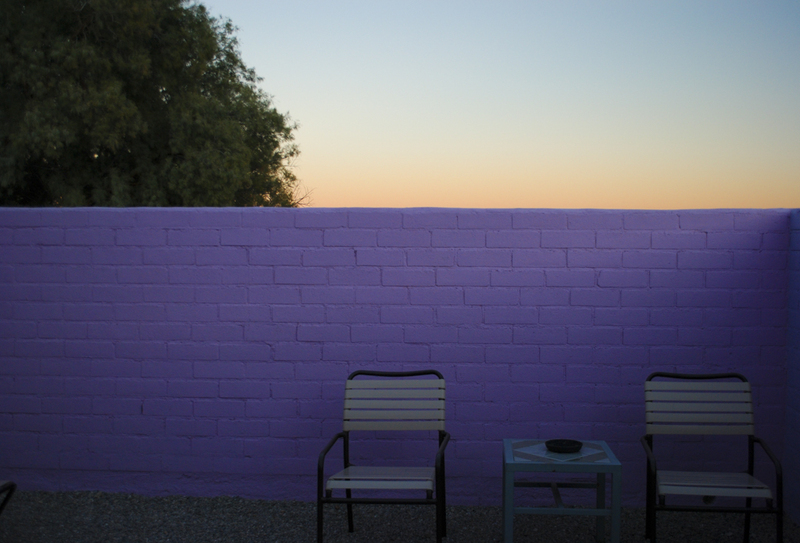 Even what starts out as the most mundane neighborhood walk can turn into something more interesting. I am always checking out the trees, shrubs and flowers that I pass, and always watching for birds. Lately I’ve been taking a new route just a few blocks from my house, down the big hill to a redeveloped community known as High Point. 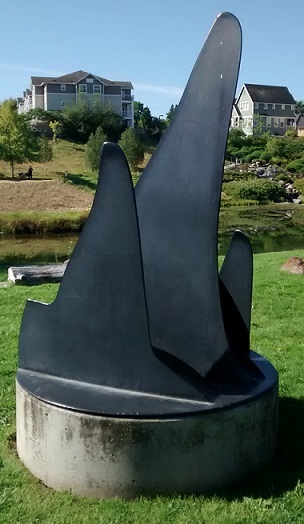 Incidentally, it is located near the official highest point in Seattle. I’ve been drawn to my particular route because it passes the large community garden, and one block beyond that lies a nice little pond. On the way, I pass such flowers as hollyhocks, sunflowers and lupines that ring the vegetable garden. Lining the street are notable trees that are dropping large seed pods. I recognized the somewhat floppy-looking leaf as being in the filbert family. 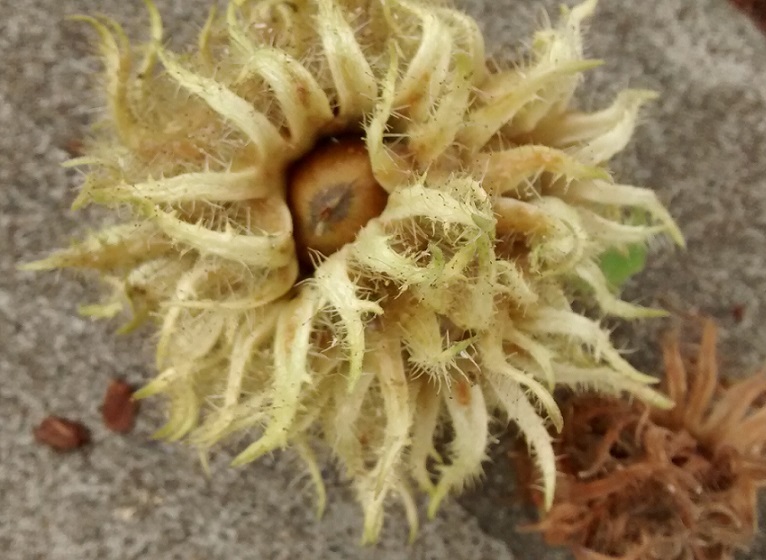 I have never seen the seeds before, which I assume become nuts like the familiar little round filberts that I recall from mixed nut tins we sometimes had in the house in my childhood. Those nuts that seemed like cheap fillers; they were not my first choice. I think perhaps these trees are not the same as the commercially raised American hazelnut trees, but very similar. 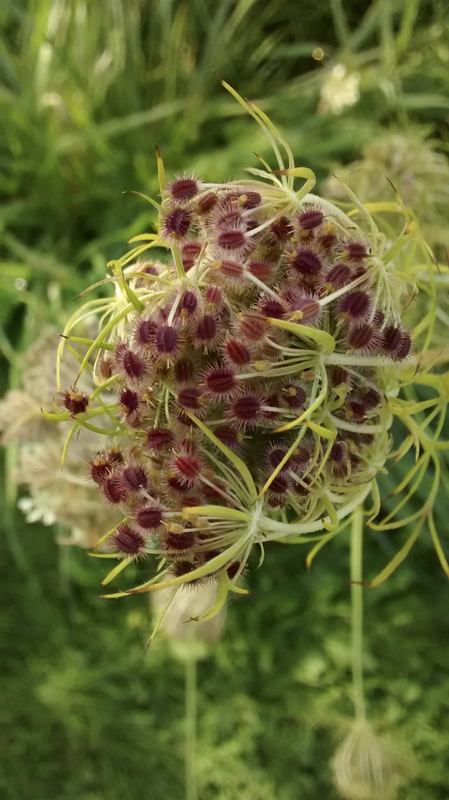 The large rather frilly bright green seed pods contain several chambers for nuts, and when you touch them they leave a sticky substance on your fingers! 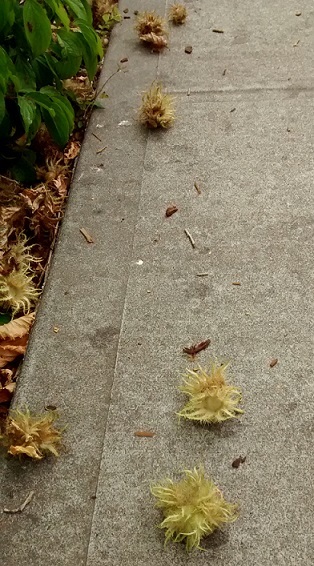 Several seed pods were strewn on the sidewalk, looking like the tribbles from Star Trek. Most were empty of their nuts. I assume the squirrels are enjoying them. Life around the pond is somewhat unpredictable. The mallards that stay there are predictable, but some days there are Canada geese. The number of mallards varies from day to day. I think some are this year’s young. The ducks are unknowingly artistic, making lovely patterns on the water as they paddle around. 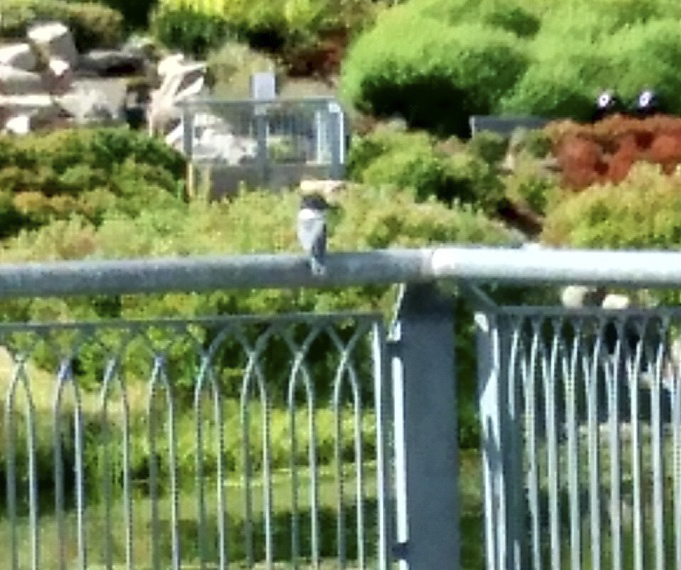 I observed them creating perfect horizontal lines, circles and Vs.
A couple times I’ve a seen a kingfisher, which is pretty cool. I’ve even heard a kingfisher rattling by from my bedroom window a couple times. Now I know I wasn’t imagining things, and I now know where it was going or coming from. I have discovered fish in the pond! No wonder the kingfisher was fishing around there. They appear to be goldfish. There are little orange ones and a blackish one. I wondered if they had been officially stocked in the pond, or whether some neighbor had dumped them there. I decided it didn’t really matter. They probably weren’t hurting any particular ecology. 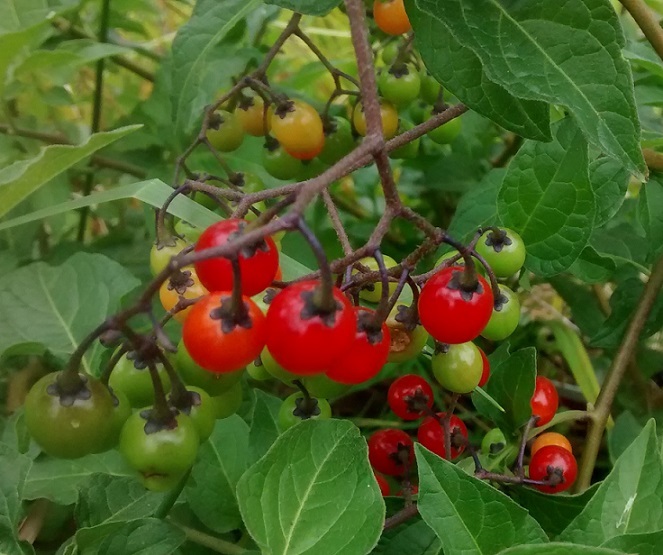 Poisonous nightshade fruits; no mystery that they’re related to tomaotes! 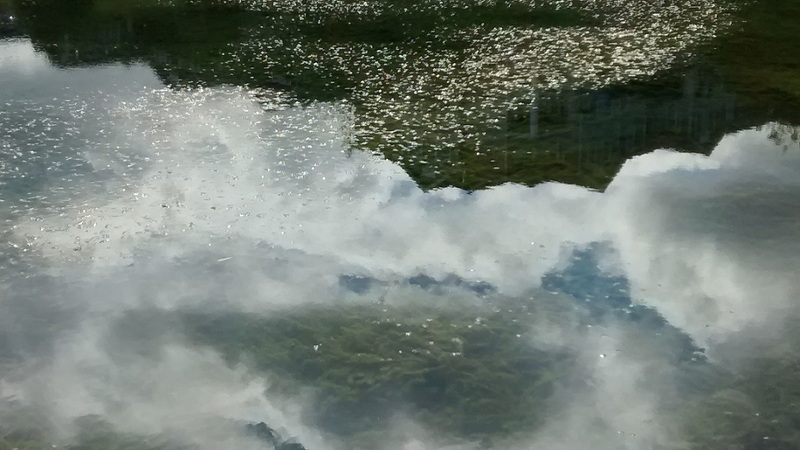 In fact, the pond seems to be getting choked by whatever the green plant is that grows in ponds and chokes them. The same thing is happening in the pond at the park next door, and door, and I wonder if the right thing to do is dredge some of it out. One day I was surprised by two white-crowned sparrows in some shrubs by the pond. They’re around Seattle, but uncommon. I almost never see them in my yard. 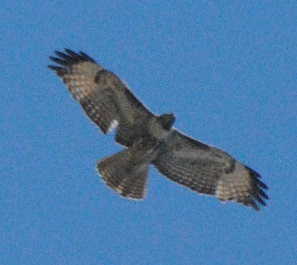 There is a nice variety of habitat circling the pond. There are trees, shrubs for covers, grassy areas, and a rushing brook and waterfall that empties into the pond. 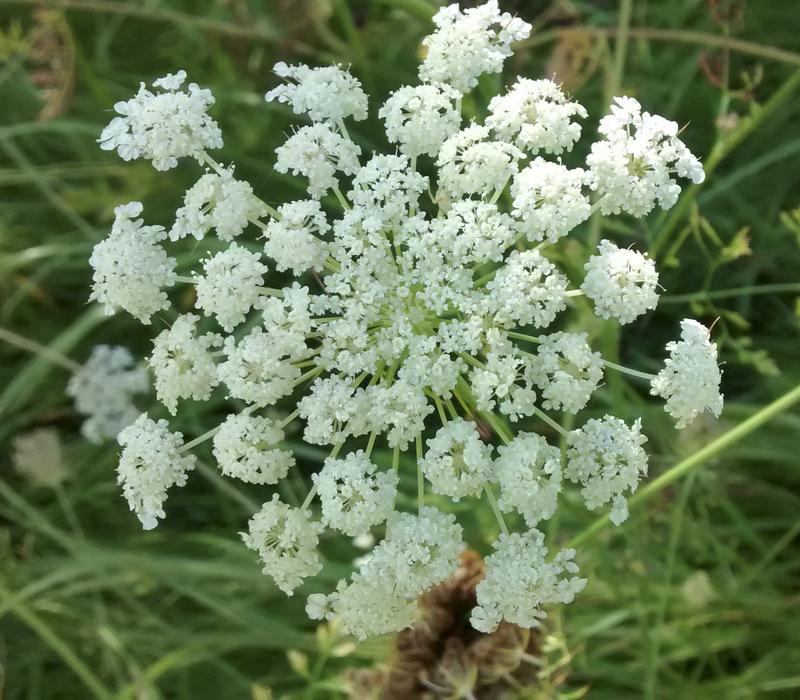 Queen Anne’s lace, clovers and thistles grow in small clumps. I’ve watched dragonflies patrol the air over the pond and I’ve seen goldfinches gliding overhead. 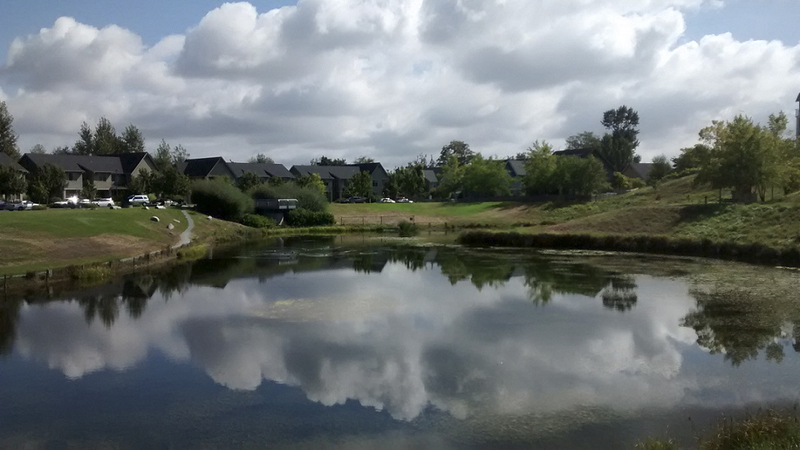 When the sun shines, a walk around the pond is warming and happy. 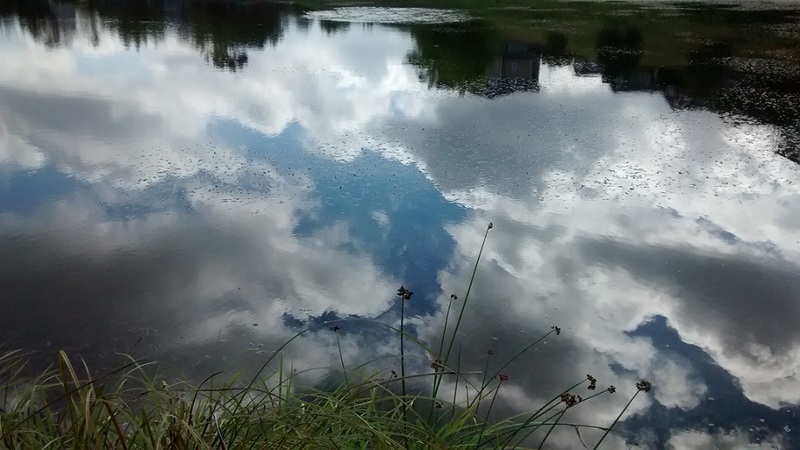 When there are clouds, there are magical reflections across the surface of the pond. 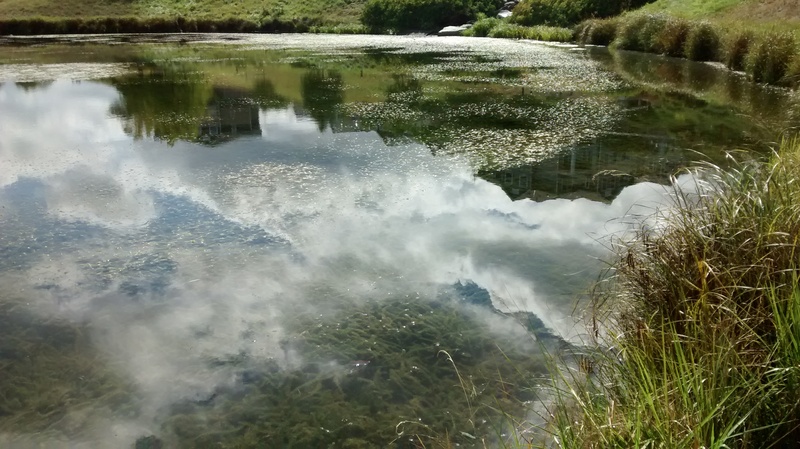 It’s a small thing, likely taken for granted, overlooked and little used by nearby residents, but for me, the pond is a fresh destination. 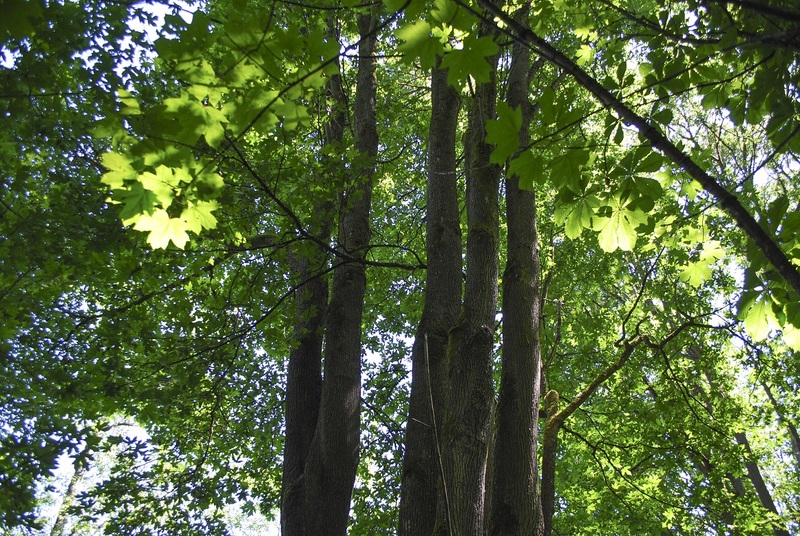 While walking in my local park, Camp Long, recently, I stopped to observe just how many multi-trunked maples there were. I had seen some before, but now I realized it seemed there were no single-trunk maples to be found. 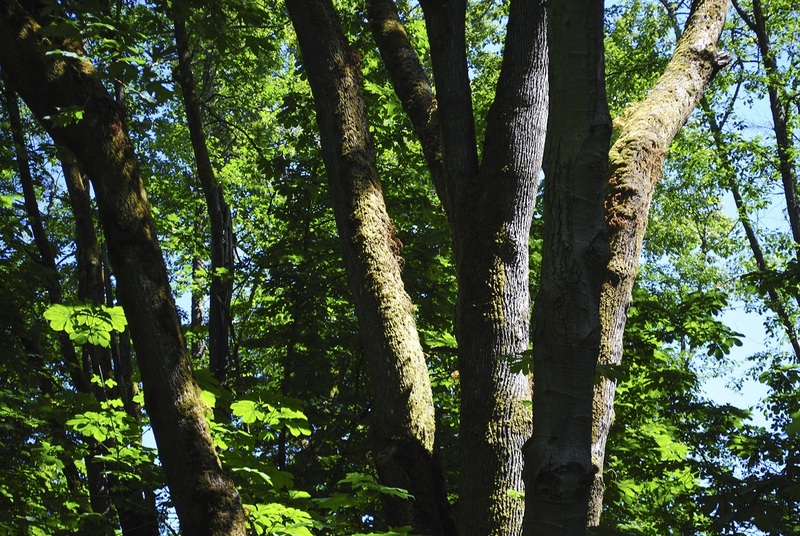 The Big-Leaf Maple is the only maple native to the Pacific Northwest. Since relocating from the east coast, I find it so easy to identify maple trees here. 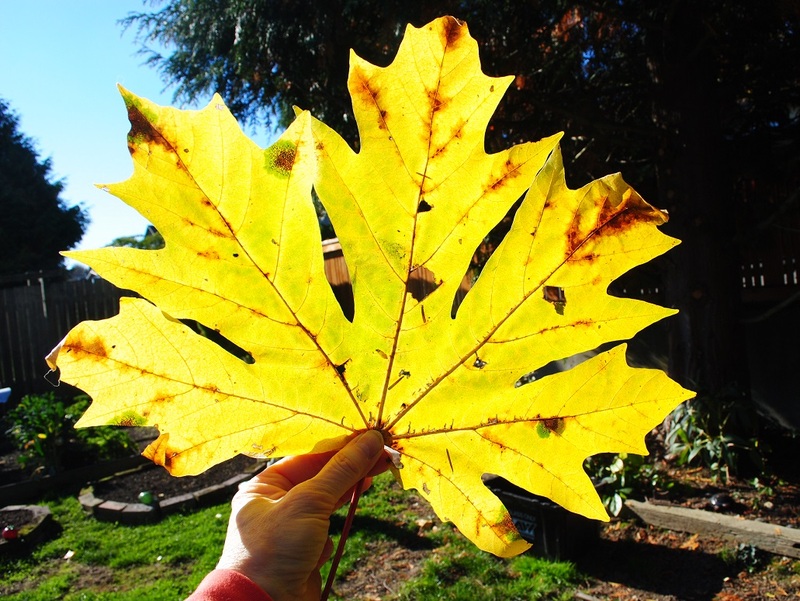 I simply declare them “Big Leaf,” and just double checking the leaves, reassure myself that I am brilliantly correct. 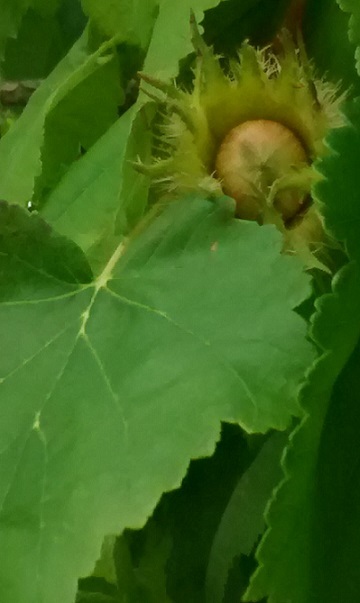 The leaves, in fact, c an be HUGE! Were I on the east coast, maple identification would be trickier. The same goes for oaks. 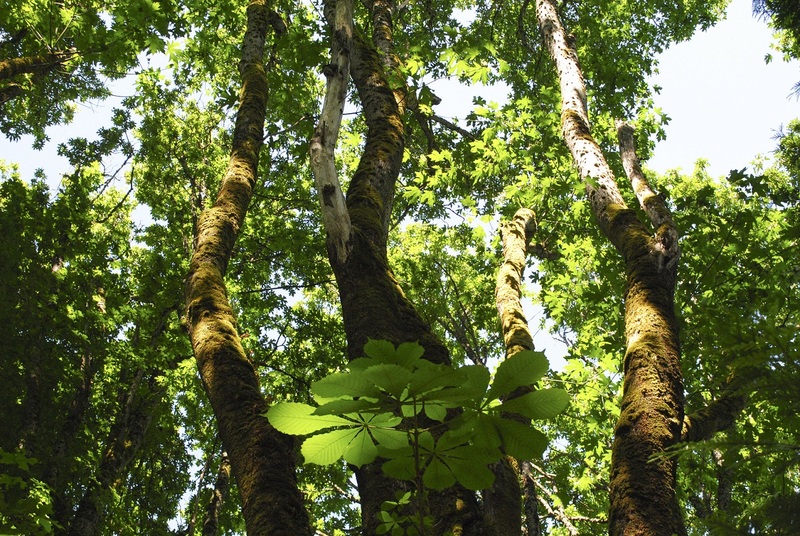 In the Northwest, we have only one native, the Garry Oak, and it’s uncommon at that. Whenever I’m in the presence of one, I feel I must pay my respects. 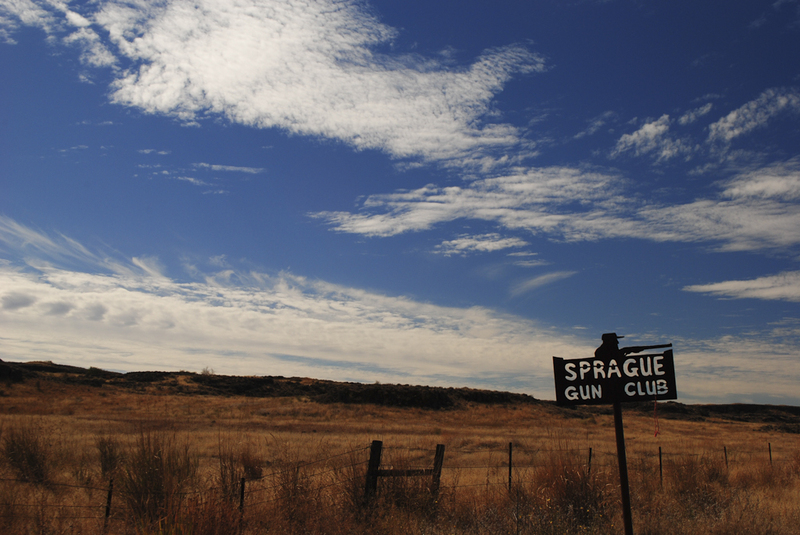 They need a particular ecosystem to thrive, a type of prairie that has grassy savannahs and gravelly dry soils. These meadow communities support grasses, wildflowers and oaks. 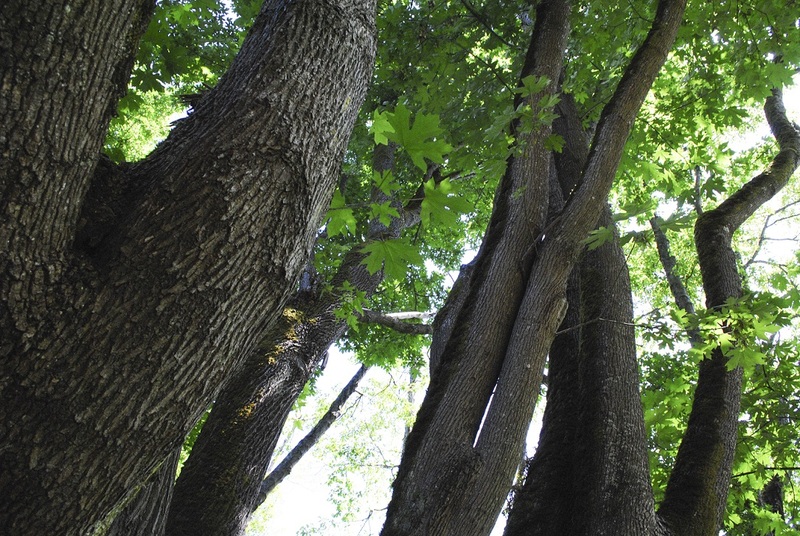 According to the Washington Native Plant Society, where these prairies still exist, the Garry Oaks have stood as long as 300 years. 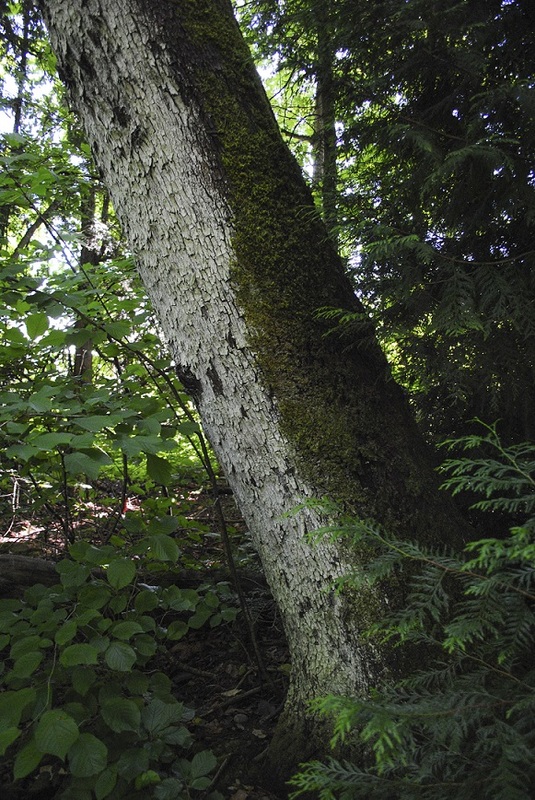 The society notes that such ecosystems are threatened by human development and encroaching Douglas firs. It seems badly ironic that one native species can push out another. But, to end my comments on oaks: the eastern states have a plethora of oak species that fall into either the white oaks or the red oaks. That sends me to my field guides for IDs. I’m grateful for some simplicity in the Northwest. However, things are not so singular and simple when it comes to conifers. I am somewhat embarrassed to admit that even after taking classes, I am still stymied by the range of fir, spruce and pine trees here. I am pretty confident in identifying western red cedars. I have one in my front yard. The tiny cones are the giveaway for me. Douglas firs, ah I have sweet memories of former Christmas trees named Doug. 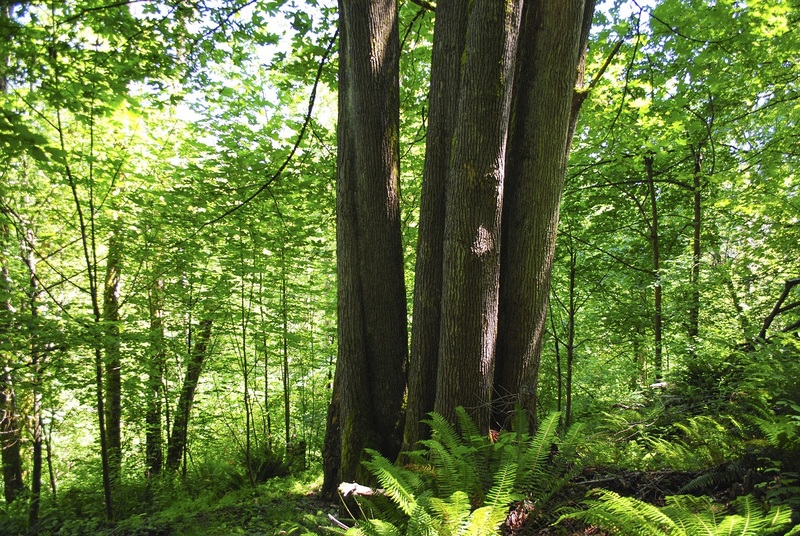 Doug firs have pale gray-colored trunks that rise straight as telephone poles. That’s my giveaway. And if I see small cones around the tree that have little fringes at the top, I know for sure it’s a Douglas fir. 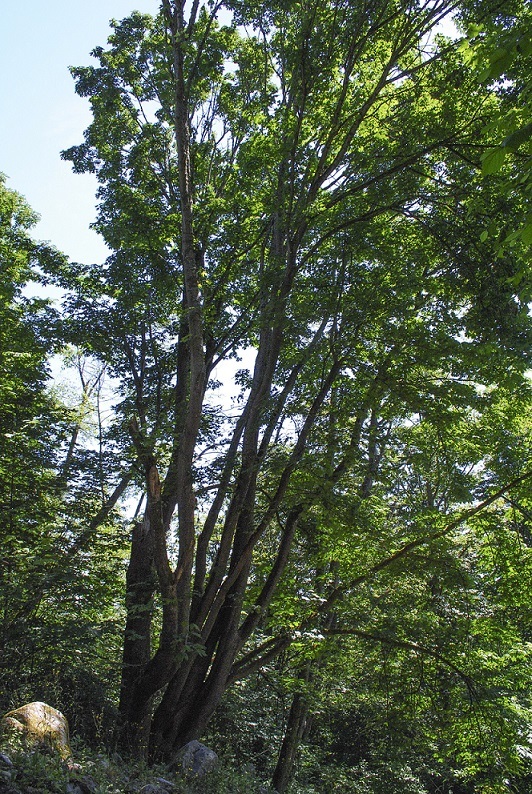 Big-Leaf maples, Acer macrophyllum, play a multifaceted role in the forest. 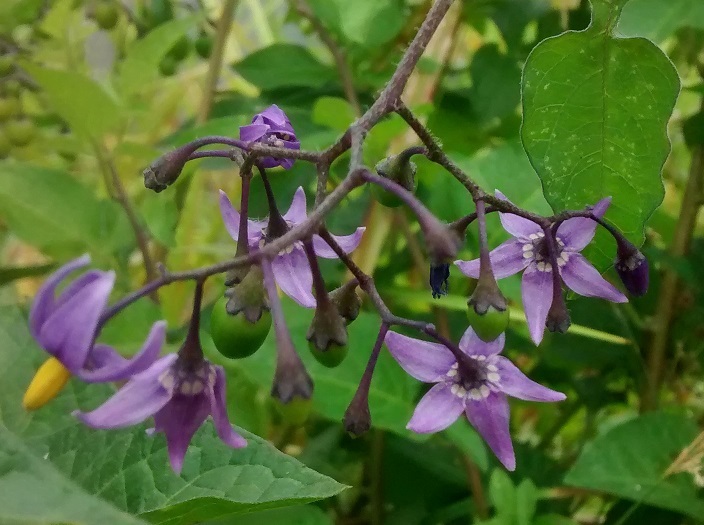 Not only do they provide food and shelter for numerous birds and wildlife, they also host other plants. Moss, lichens and licorice ferns grow on the bark. 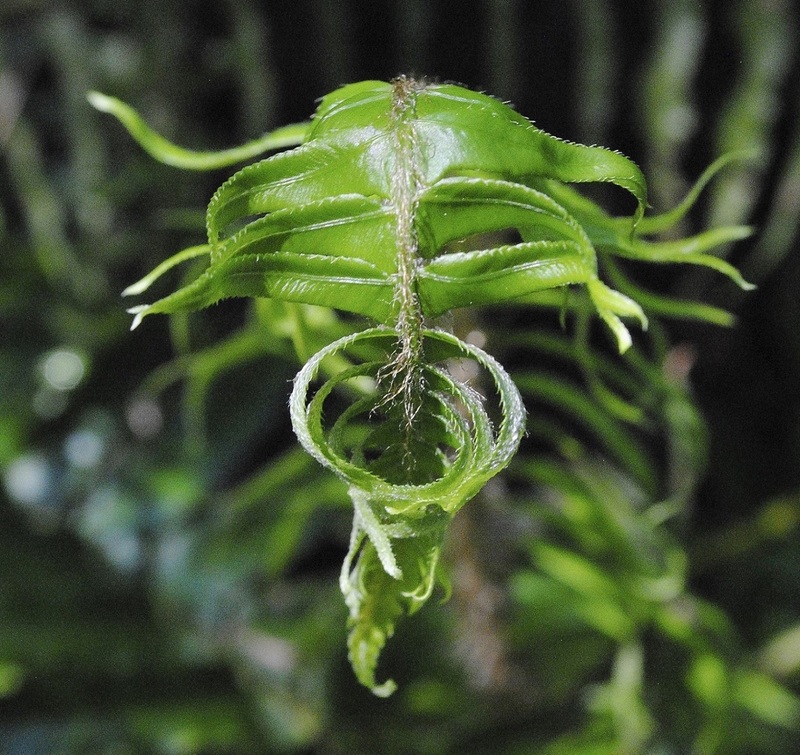 They grow rapidly and can reach 100 feet high and 50 feet wide at the canopy. These trees live up to their name. 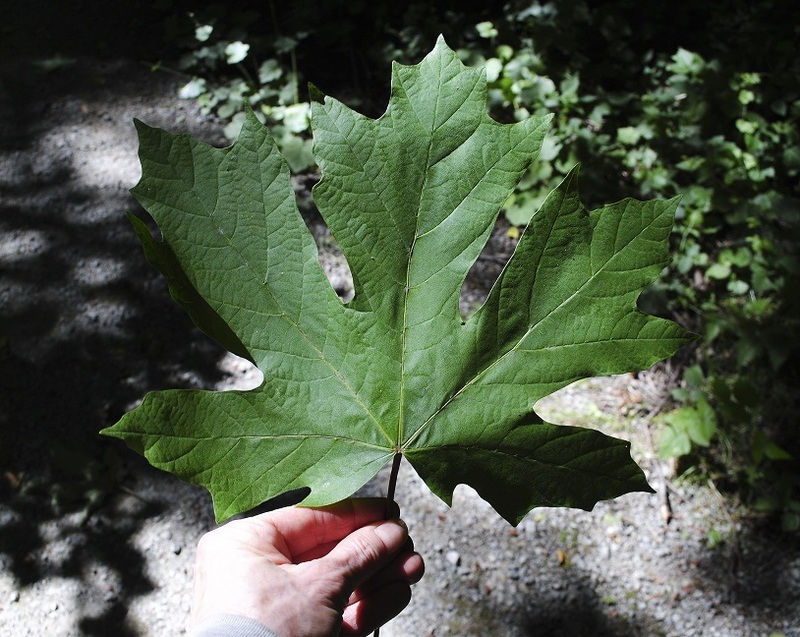 While the trees are large, their five-lobed leaves are the largest of the maples. Every fall, when the golden leaves start to cover the ground, I like to try to find the biggest leaf. 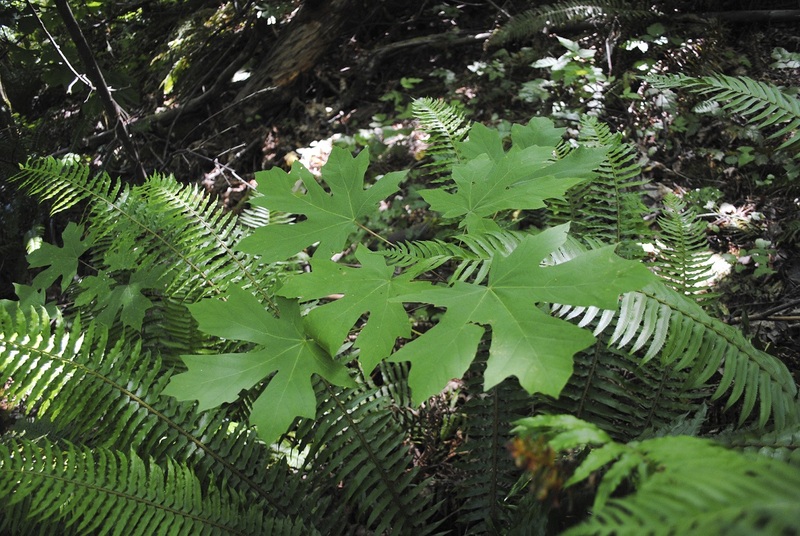 But the most fascinating thing to me about big-leaf maples is their habit. 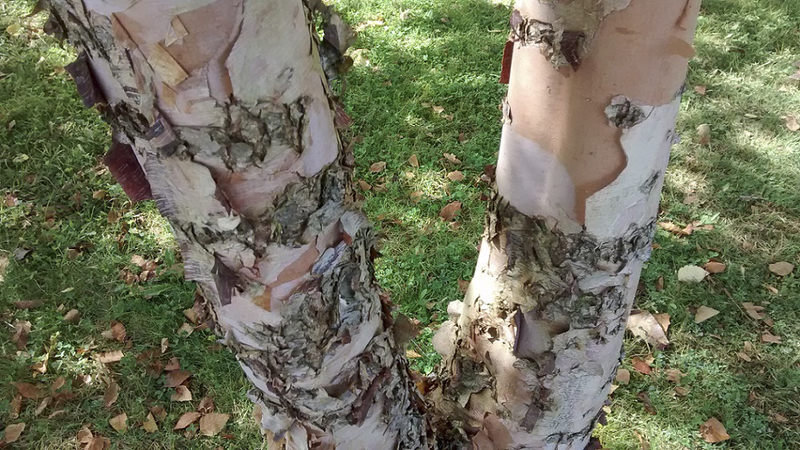 The original trunks diverge into several others, which I will call siblings. And then, even some of the siblings further branch off! I had to find out whether this was normal or just random. 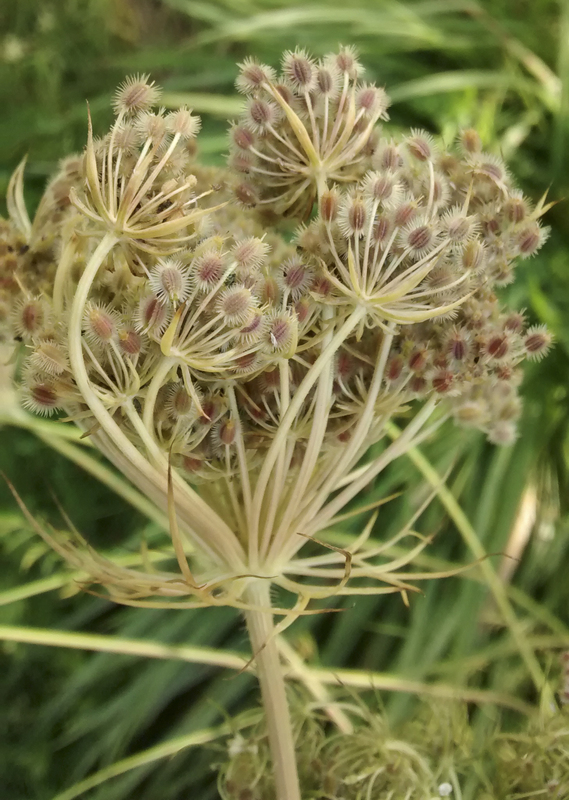 In some ways, they reminded me of celery, with many stalks rising from the base. 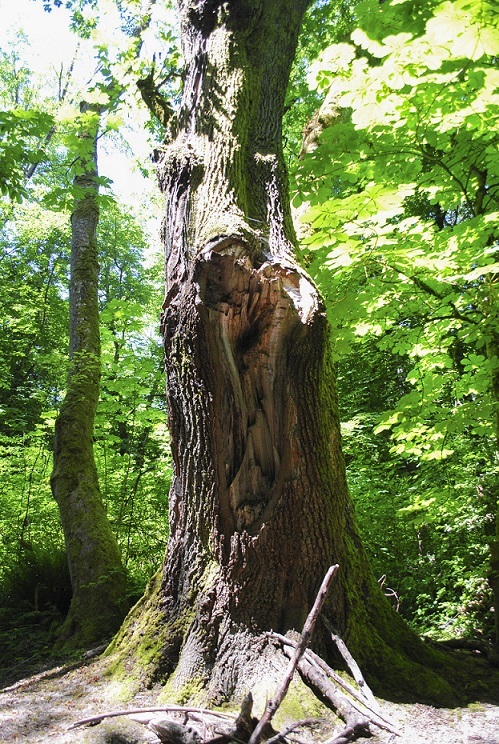 Upon some light research I confirmed that big-leaf maples do grow this way and it is quite normal. 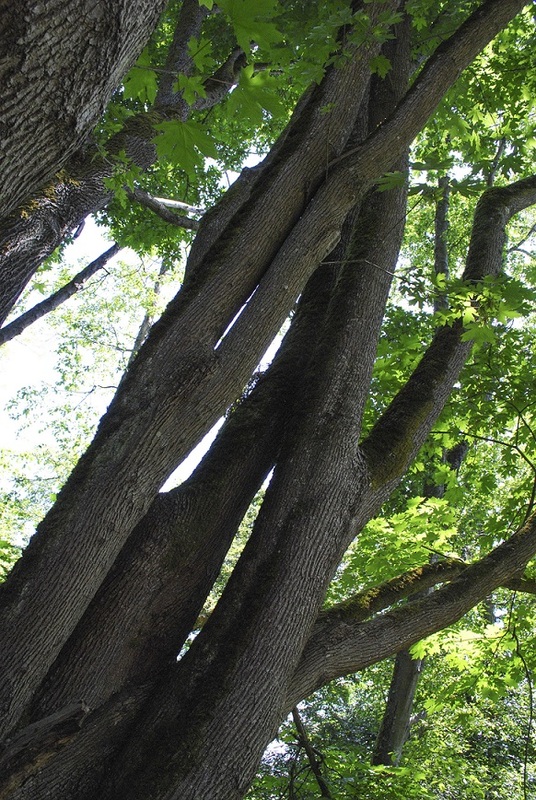 In fact, it would be abnormal to have a 100-foot tall big-leaf maple that had only one trunk. I doubt that ever occurs. 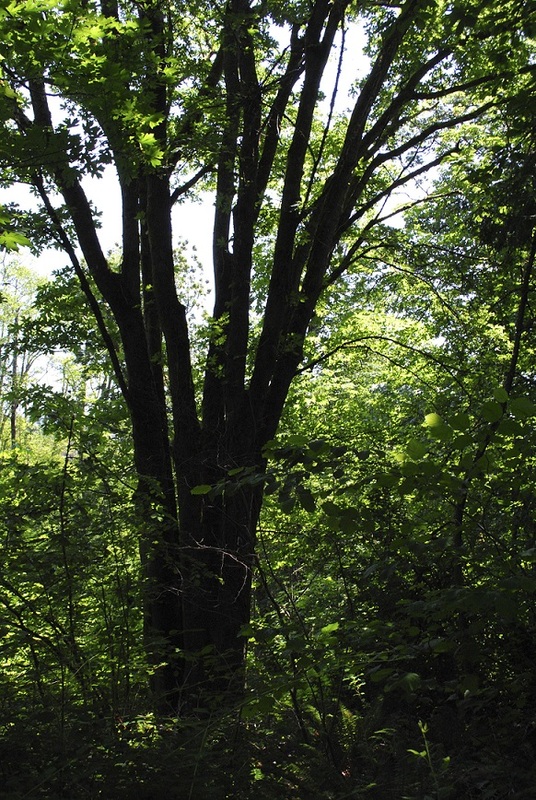 The result is, as you walk through the woods, you experience a landscape that is richly layered, not monotonous. There’s not a single-trunked tree here and a single-trunked tree there. 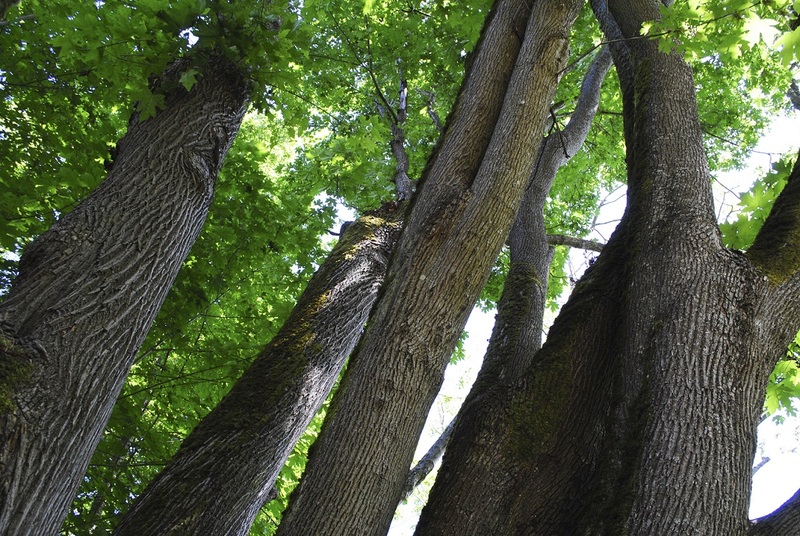 There’s a maple with five massive trunks here, and one beyond with six, and for every tree, the height at which the trunks join or diverge varies. Some siblings lean far out from the others. 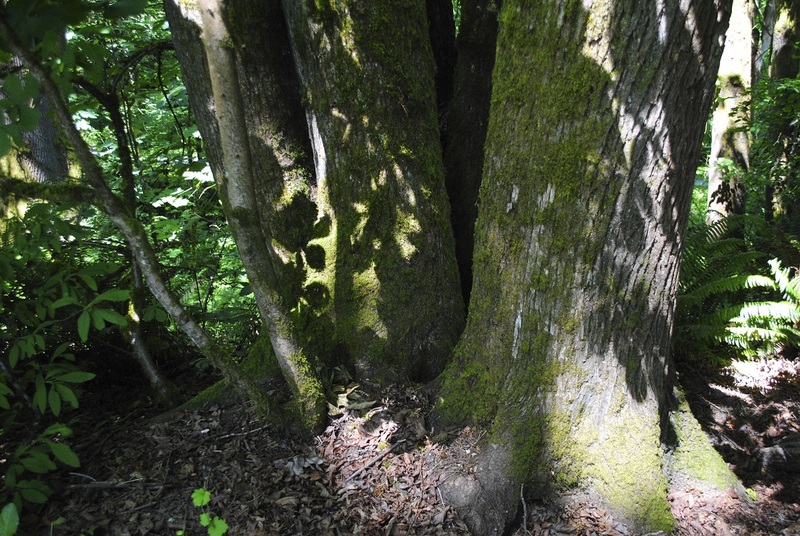 The bases of these mature trees are also interesting to study. 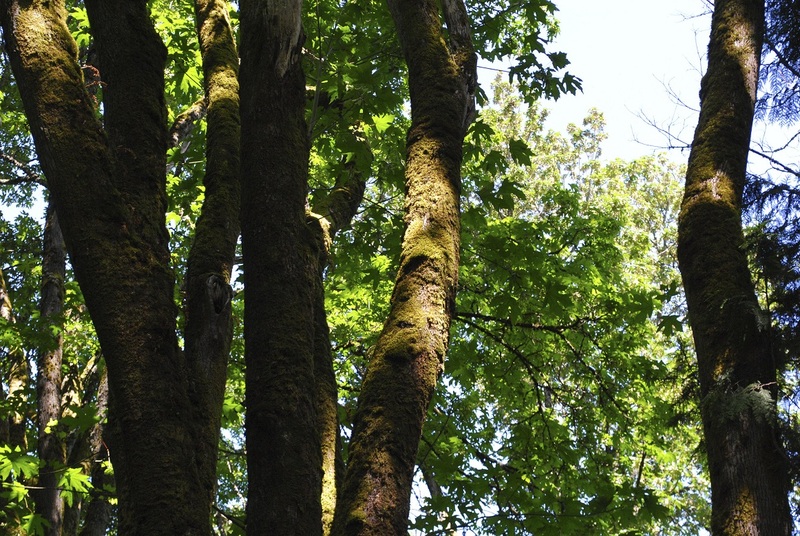 The national champion Big-Leaf Maple is listed by American Forests as standing in Lane, Oregon, at 119 feet high, and 91 feet across the crown! 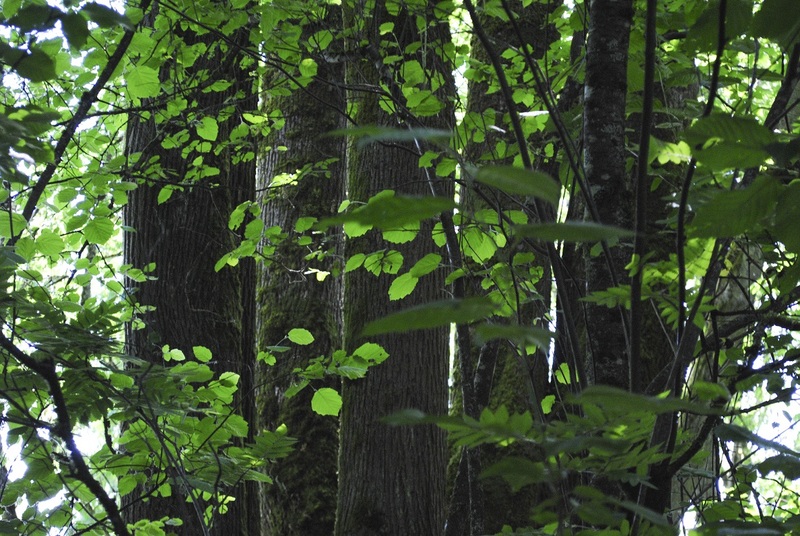 No doubt these trees dominate the forest and are vital to the ecosystem. 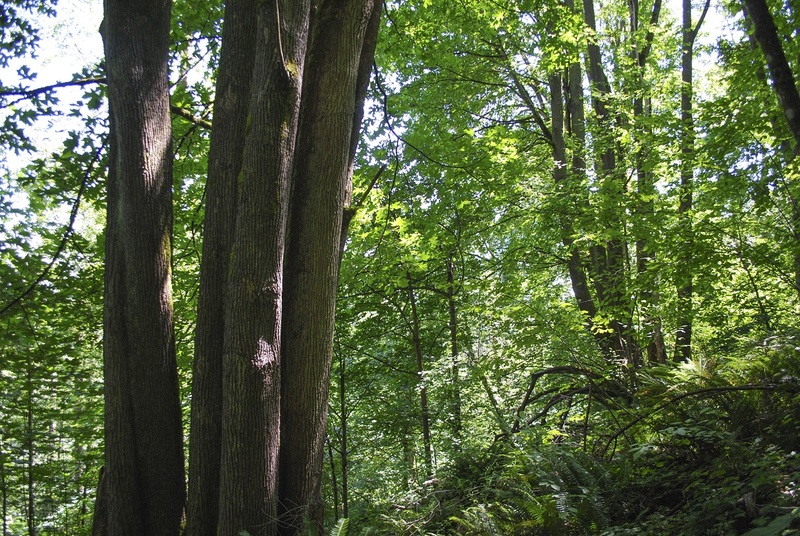 Other big companions include conifers, madrones, buckeyes (horsechestnuts), alders and poplars. I’m grateful that even though my park is heavily used by humans, it has a good variety of native plants and provides habitat for wildlife. 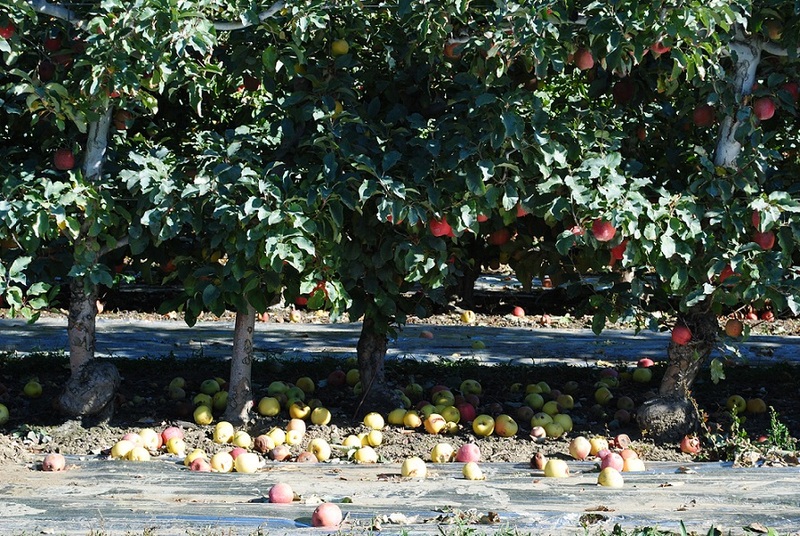 Gala, Pink Lady, Jonagold, Red Delicious, Golden Delicious, Honey Crisp, Granny Smith, Fuji, Braeburn, Cripps Pink. Can you taste the sweetness and feel the crunch? 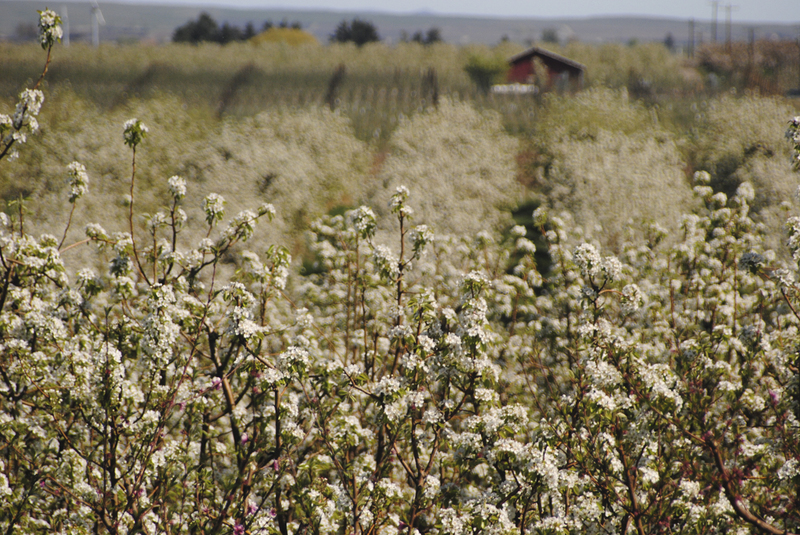 Washington state is the apple-growing leader nationwide. 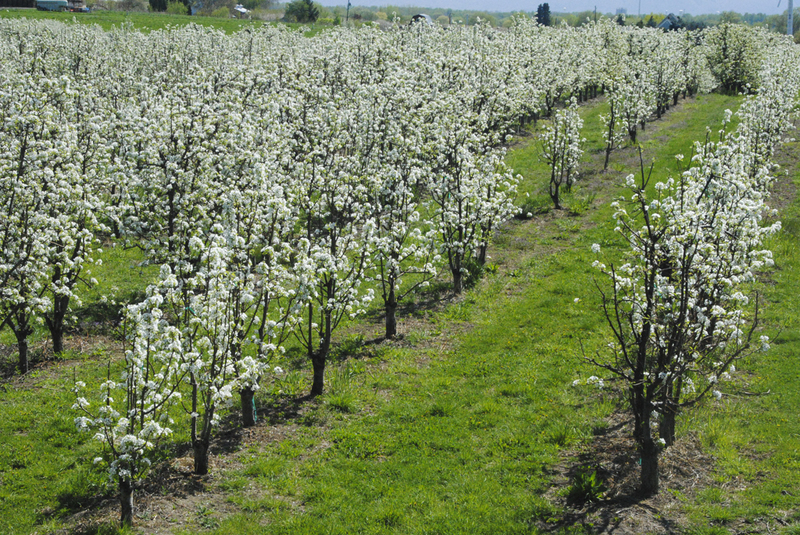 You’ll see proof of this if you drive around Yakima Valley or Wenatchee, where the orchards are concentrated. The other top regions are the Columbia Basin, Lake Chelan and Okanogan. 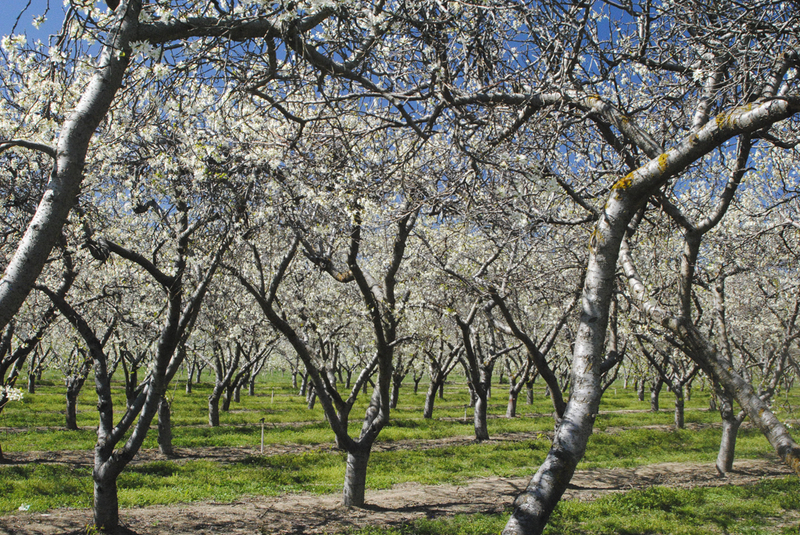 I wanted to photograph orchards in bloom for a while. I thought, rightly so, that huge stands of trees covered in white blossoms must be a sight to see. 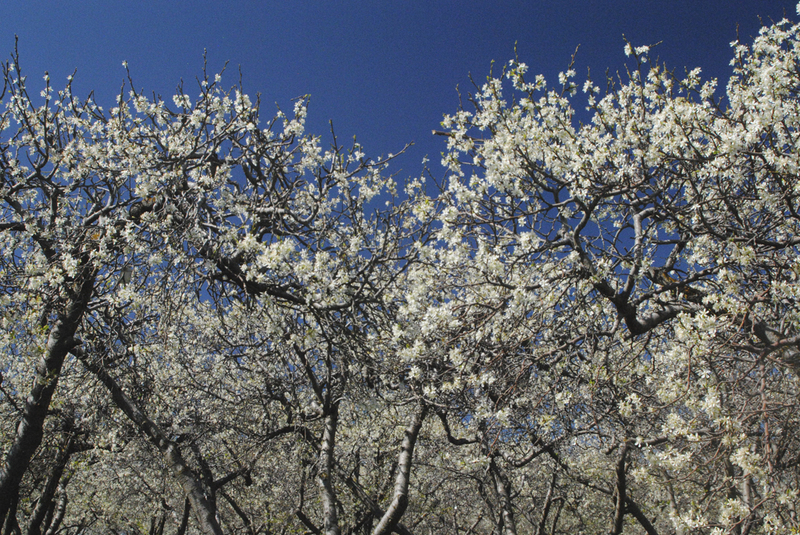 Not just apple trees bloom in the spring, but also pear and cherry. 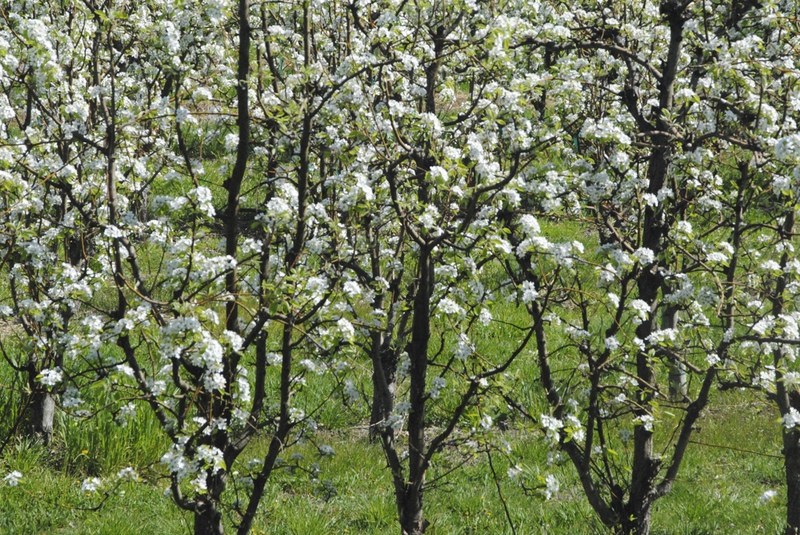 I had written off finding cherry orchards and focused on apples. Pears, if I found some, would be the ice cream on the apple pie, so to speak. 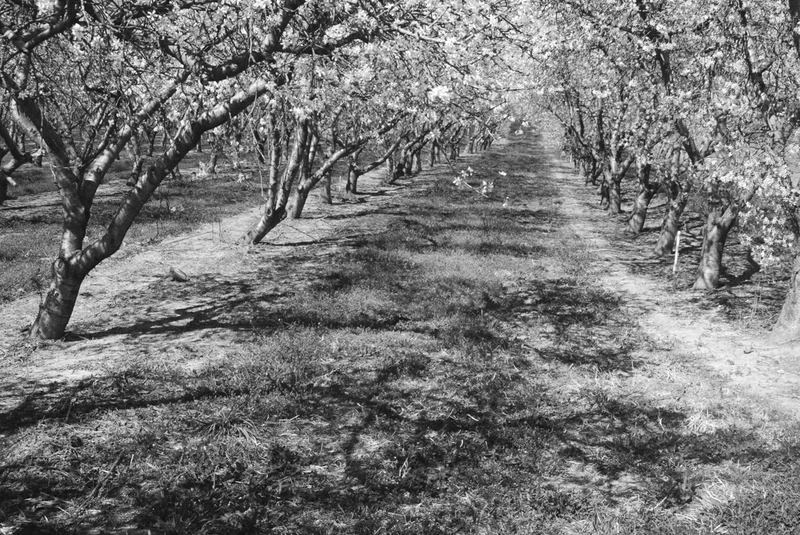 I had driven around Wenatchee once, so I knew there were many orchards there. In fact, the town has an apple visitor center, where you can learn all about the state’s sweet crop. But Wentachee was a longer drive from Seattle than Yakima, so I scouted out some areas near Yakima last fall, and found an ideal spot in Zillah. My gut told me this could be the time, but in order not to miss the blossoms, I needed to go have a look. To Zillah I headed. It’s about a two-hour drive through shrub-steppe country. There‘s a nice rest area near Selah with a view of Mt. Rainier and Mt. Adams where I usually stop for lunch. There was a clear view of both peaks. After my break I headed on to Zillah. 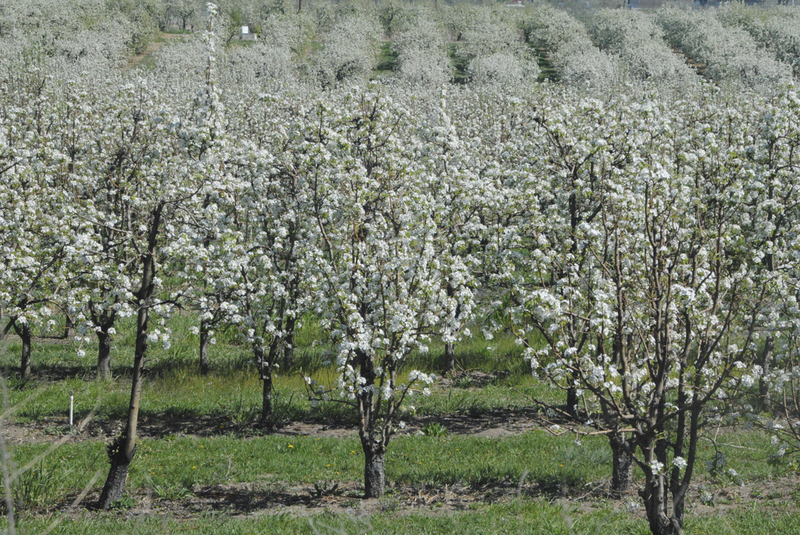 But before I got there, I began to see orchards in bloom, and whitish blobs covering the hillsides in the distance. 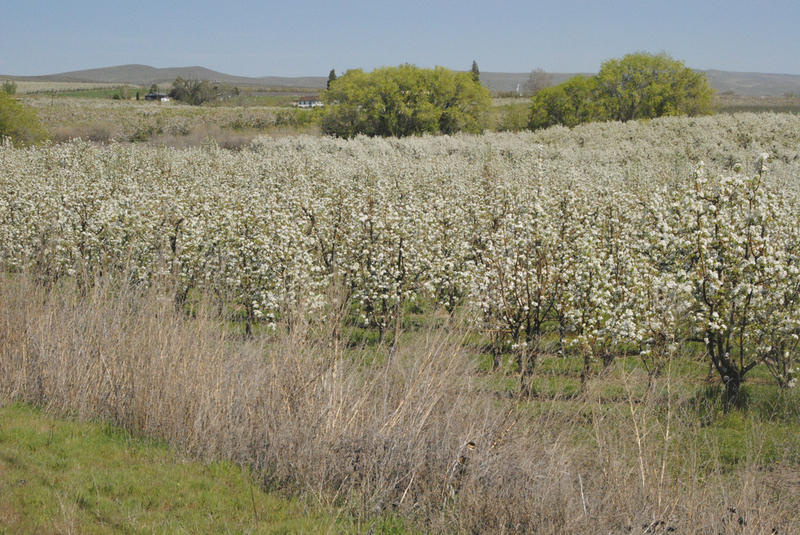 It took a minute to realize I was seeing apple orchards in peak bloom! I made a quick decision to take the next exit and find the road that was closest to the orchards. I was just ahead of Zillah, but I knew I didn’t need to continue on. I wouldn’t find anything better. It turned out I had arrived in the little town of Buena, and buena it was! This is not a ritzy area and the homes are very modest, but it seemed that even the smallest p lot of land had a mini orchard on it. Apples are lifeblood here, or at least, a sideline. I found a main road that stretched north to south, with orchards in view. I turned off to a side road to get closer to the trees. 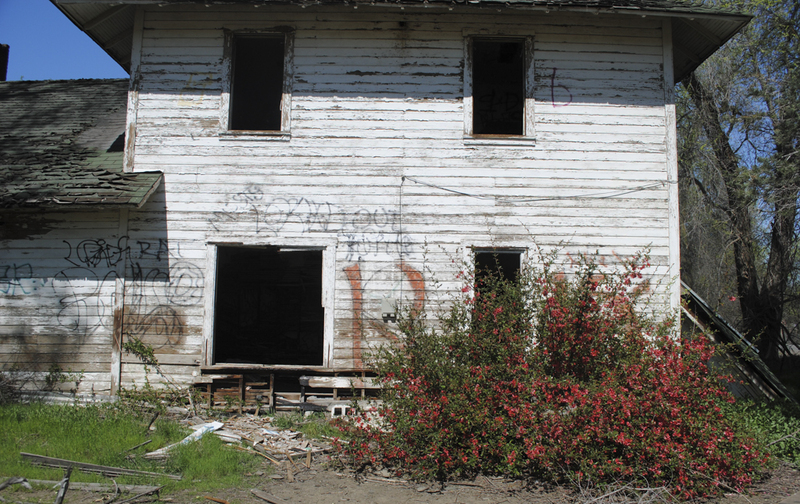 Along the way I found a big old abandoned house and just had to stop to photograph it. Large trees cast soft shadows on the grass in the bright sun. 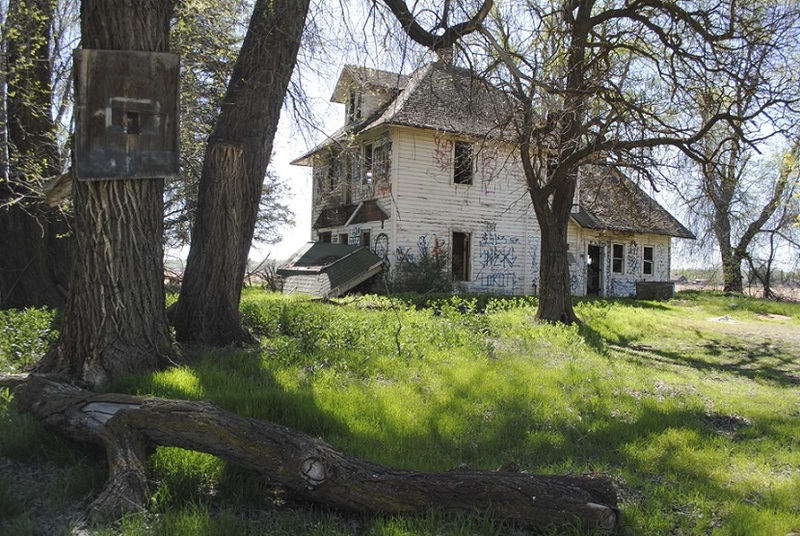 A hundred years ago it was a grand house, surrounded by farm land. 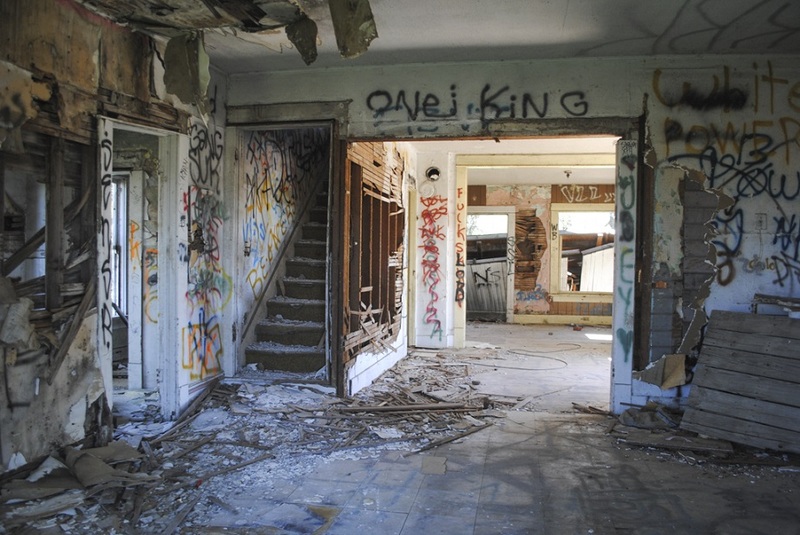 Now its windows were gone and the inside all graffitied up. 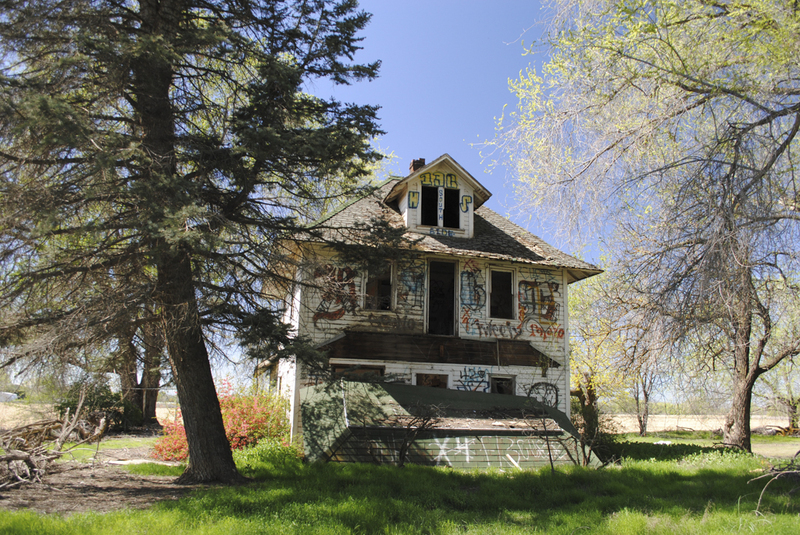 I wondered how such a once-grand house could get to this state. But I had to move on and find my orchards! 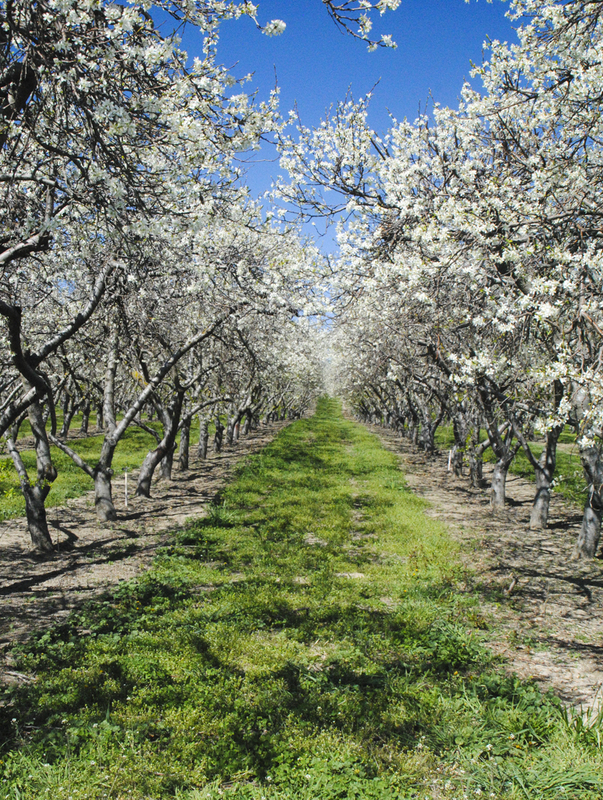 I scanned the landscape as I drove, and spied an orchard up a side road that looked promising. I turned around and headed up the hill. Beautiful orchards on either side of the road came into view. I pulled onto a dirt drive and got out of the car. As I was admiring the landscape, I could hear what sounded like a hawk nearby. I looked around and finally looked up. 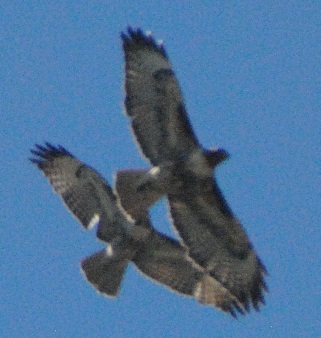 Overhead were four red-tailed hawks, perhaps two pairs, wheeling around and squawking. What a treat! 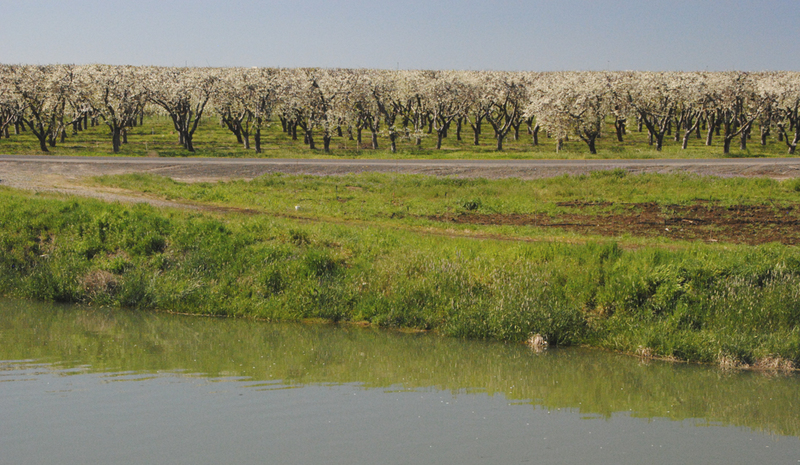 Across the road and along the irrigation canal was another orchard. Mt. Adams loomed to the west. 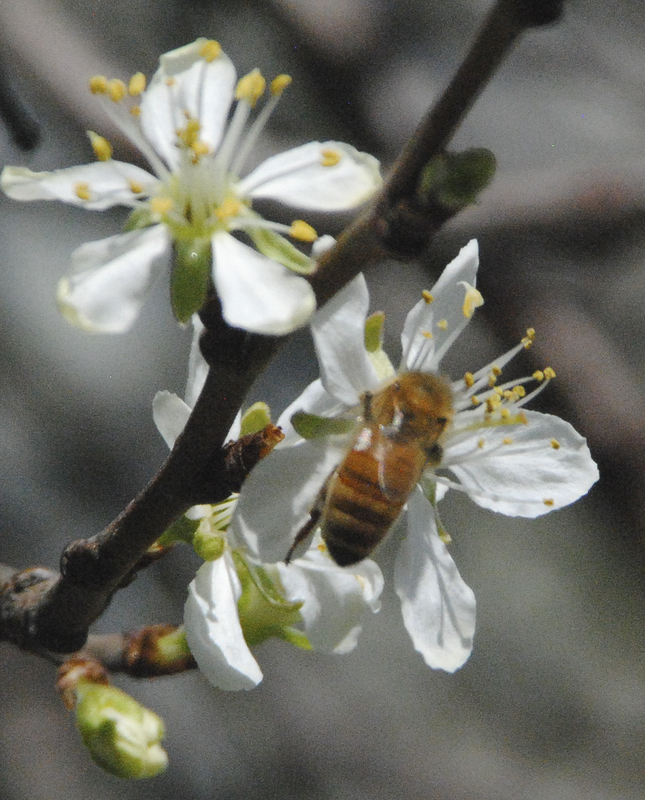 Upon close inspection of some blossoms, I noted that bees were happily buzzing from flower to flower. 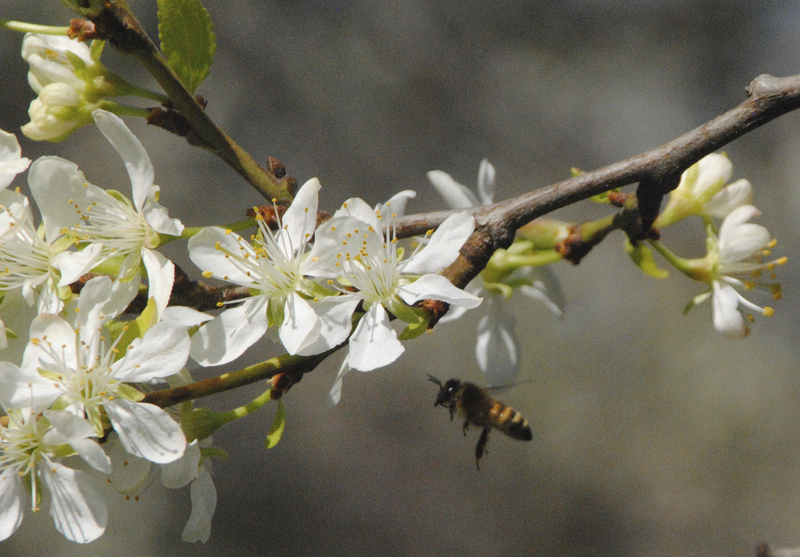 I wondered if the orchard owner had rented bees. I didn’t notice any hives, but I guessed that bees must be rented every year to polli nate all the trees. 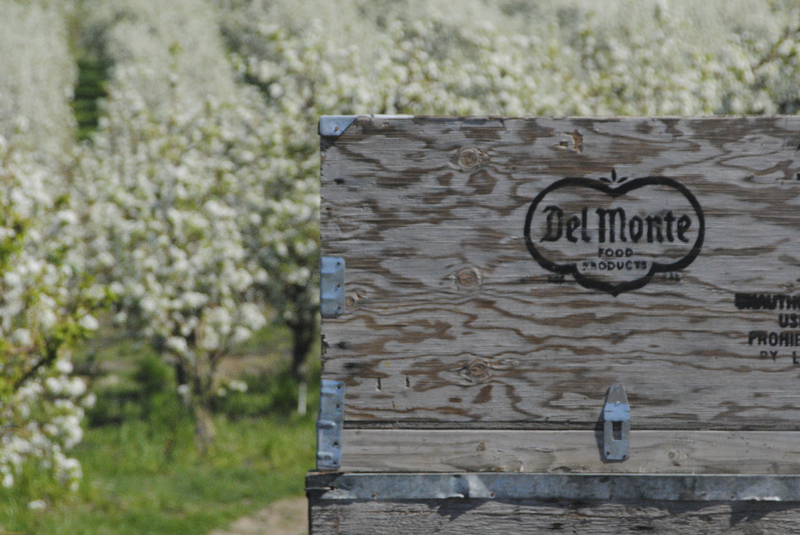 When apples are harvested, they’re loaded into traditional wooden boxes, which hold 40 lbs. of fruit each. You can see these in big stacks here and there. 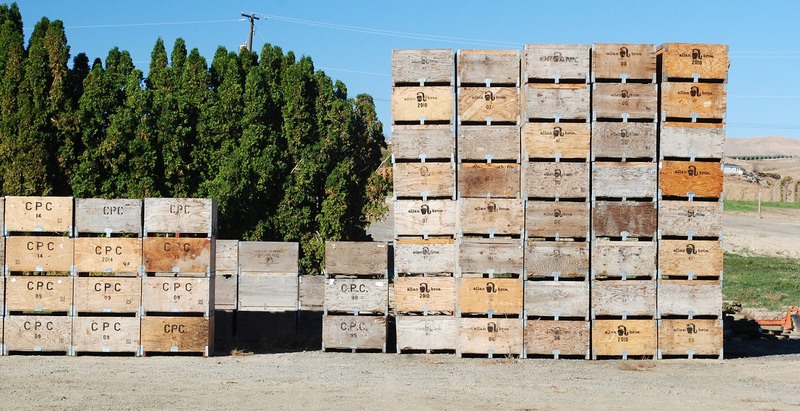 On average, the state harvests 125 million boxes every year. Washington grows 6 out of every 10 apples eaten in the United States, and its apples are enjoyed in some 60 different countries. Though the varieties that we export are a paltry drop in the apple crate when you learn there are 7,500 varieties of apples grown around the world. Apples arrived in the new North American world with the colonists. Archeologists have determined that apples have been eaten as long ago as 8,500 years, according to the Washington Apple Commission. 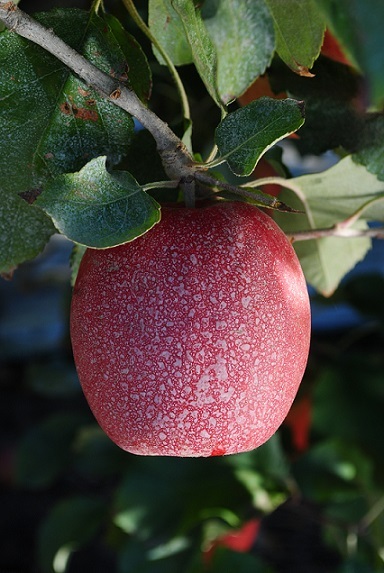 Apples are said to have originated in Central Asia millions of years ago. So Adam and Eve might not have been the first to indulge. Various notions and legends about apples have been passed down through generations. “An apple a day keeps the doctor away.” We also say, “as American as apple pie.” Putting apples in a pie may be American, but now we know apples themselves are hardly American. We have our folk hero, John Chapman, aka Johnny Appleseed, whom we imagine lived humbly, dressed shabbily and went barefoot, casting apple seeds everywhere he went. In fact, he was a nurseryman who collected seeds and raised trees. Crunchy, sweet and juicy. Red, pink or yellow. The next time you bite into one of nature’s wonders, think of the growers who nurture their trees and the countless laborers who hand pick the fruit every year so you can enjoy it! Sometimes it takes a few decades for something to come full circle. Back in the 1970s, I lived and worked in Connecticut. New England is a wonderful place to go antiquing and browse flea markets. 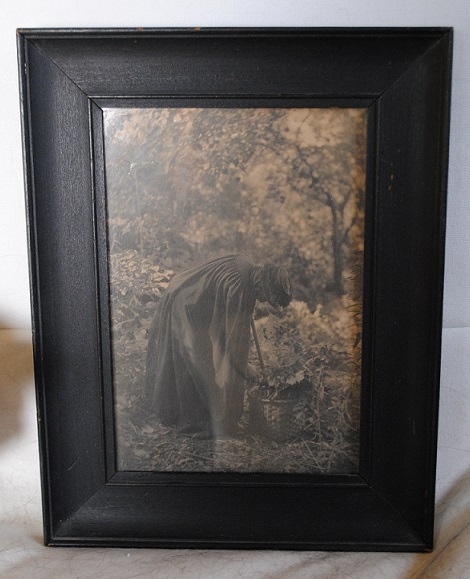 It was at just such a market that I happened to spot an old photograph, leaning against something on the ground, not very visible, not looking very valuable. It was quite dark and had a black frame, so the overall look was very dark indeed. For years I wondered about the image. Was it truly a woman considered by the community to be a witch? after all, Deerfield was a hotbed during the heydays of witchcraft madness. Or was it just a model posing at one? Who were the Ray sisters? And who were Frances and Mary Allen? Recently on a whim I decided to do some internet poking around to see what I could find. Instantly I turned up information about the Allen sisters, Frances and Mary, to whom my photo was attributed. How exciting! It’s so easy to play detective when you have the internet at your fingertips. 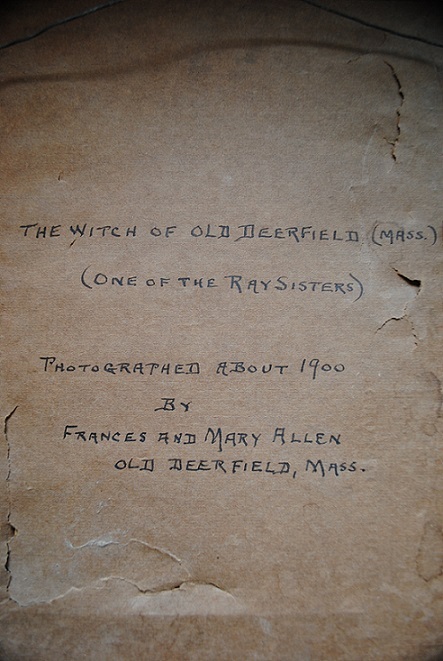 I read all about Frances and Mary, and their life and work in Old Deerfield, Massachusetts. I found an article from the New York Times that talked about them and their work, and a collection of Allen sisters photos in the Memorial Hall Museum in Deerfield. These two talented, entrepreneurial women became quite successful in this medium at the turn of the twentieth century. They had been teachers, but began to suffer from hearing loss, and found interest, skill and financial security in photography. They received many awards for their photographs at various salons and exhibits, and their work was published in many periodicals. They made a good living from their art. They caught the eye of Frances Benjamin Johnston, a noted photographer of the day, who was also the White House photographer for the Cleveland and McKinley administrations. She became a supporter and mentor for the two sisters. 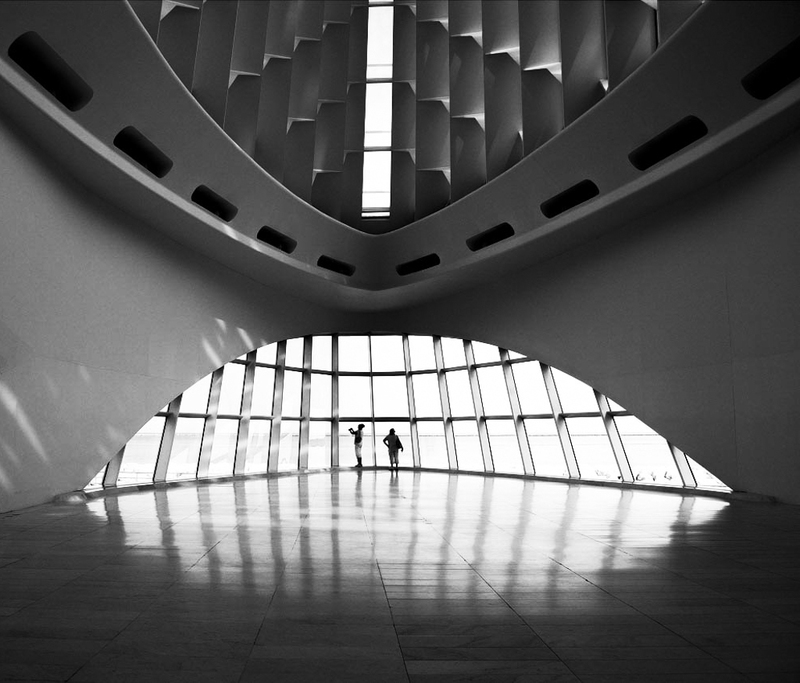 I was riveted to the words and images on the Clio website, and searched for my image there. I did not find it, but found some similar images and knew I had the real thing. 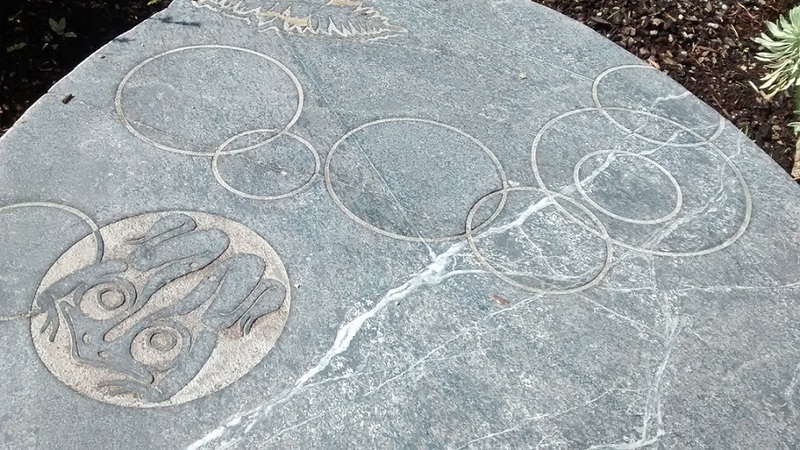 I decided to contact the Memorial Hall Museum curator, Suzanne Flynt, to see whether the museum might like to have my piece in their collection. I had enjoyed the photo for decades and decided I could part with it. I emailed photos of the image to her, and she confirmed that the museum does not have this exact image. Good news! “The woman in the photograph is Miss Caroline Ray, who provided flowers to the Deerfield Church every Sunday,” noted Suzanne. Wow, another mystery solved! The outcome: Suzanne would be pleased to have it, and I am pleased to donate it! Giving it to the museum seems like the right thing to do, to have it as part of the Allen sisters collection. I think Frances and Mary would be pleased. The Witch of Old Deerfield will be home at last.